Nintendo has unveiled the trailer for Pokemon Sword and Pokemon Shield, the next instalments in the franchise for its Switch console. In 2018, family-friendly remakes of the original Red and Blue games were released for the Switch and became huge hits. But Sword and Shield are brand new Pokemon games with new monsters to collect and new worlds to explore. They also mark the first ‘real’ Pokemon games for a home console. The Pokemon series made its name on handheld consoles and later on mobile phones in Pokemon Go. Spin-off titles, such as Pokemon Stadium and fighting game Pokken Tournament have been hugely successful on consoles. Players will start the game with one of three starting Pokemon, all brand new to the game. They are grass-based chimp Grookey, fire-rabbit Scorbunny and water lizard Sobble. Pokemon super-fan Dan Maher says the new trailer looks “fantastic’ and is an “overhaul” for the long-running series. “We’ve been waiting to see a Pokemon game that plays like we know and love them, but reflects modern graphic sensibilities,” he tells Newsbeat. 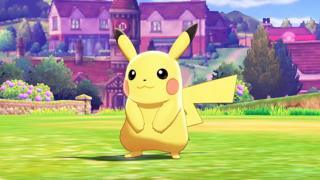 He believes Nintendo – and developers Game Freak – have been reluctant to put the game on a home console, as portability was part of the appeal of Pokemon since day one. Oh, and he’ll be choosing Scorbunny as his starting Pokemon. The game was announced on 27 February, also known as Pokemon Day to fans of the series. That’s the date the original games were released in Japan in 1996. And 23 years after it’s original release, Pokemon is set for a huge year in 2019. As well as the new games, the collectable, ball-dwelling creatures will make their first live-action movie appearance in Detective Pikachu. A new trailer was released for that earlier this week. It stars Ryan Reynolds as a coffee-drinking Pikachu and Rita Ora in an unknown role. Pokemon Sword and Shield are expected to be released later in 2019.